For history of the Westminster Hospital in Iran, see the text beneath the two photos on this page. Joseph P. Cochran, 1855-1905, was the son of American Missionaries in historical Urumia, now known as Urmia. It was the seat of the first U.S. Christian mission in Iran (1835) that served the Kurdish population and Christians, largely descendents of Nestorians who immigrated to Persia in 489 AD to escape persecution by the Byzantine Empire. Around the year 1900, Christians made up more than 40% of the city's population. Today, Urmia is a modern city, with a population over 350,000, proud of Urmia Semiconductor Inc, developed at their University. Located near Iranian borders with Iraq and Turkey; it is close enough to Mount Ararat to be in "the land of Noah." Joseph P. Cochran lived in the home of S. M. Clement, I, in Buffalo for several years, while preparing himself to return as a Medical Missionary. In 1879, after he had been in the field for about a year, he persuaded the Station and the Mission Board in New York that a hospital should be built. Westminster friends and other supporters of missions gave the comparatively small amount needed. It was finished in 1882, and named Westminster for our Church. In 1890, an addition to the hospital, known as the Women's Annex, was built through the generosity of the George Howard family. In 1898, the Session of Westminster Church assumed the full support of the hospital and of Dr. Cochran. After his death in 1905, Stephen M. Clement, II erected in Dr. Cochran's memory a building connecting two older structures. The twenty-seven years of Dr. Cochran's Medical Missionary Service was notable for the extension of Christian influence among the Kurdish people of NW Iran. Robert E. Speer, in the beginning of his Biography of Dr. Cochran, describes him as-"The Medical Missionary, who was to be the friend of Princes, defender of the poor, the counselor of Muslim Governors and of an ancient Christian church, the deliverer of a city and father of a people." However, the fateful cycle in history of the World Wars also engulfed Iran. First came the "Russian Occupation", as Dr. Packard, who had succeeded Dr. Cochran, wrote in 1913. Then in 1918, the storm broke in all fury, and Turks and Kurds were fighting Russians and native Christians on Iranian soil. The latter were principal sufferers. They fled to the hospital and Mission Compound for refuge. Later some five thousand of them retreated southward to the British Lines. Meanwhile, violence continued and John Mooshie, whose widow was a member of our Church, was murdered in a Missionary home. Dr. Packard stayed on, a heroic figure of defense for all the remaining Christians, until he too was forced to leave, escorted by the American Consul and Iranian Authorities to a place of safety in the American Mission in Tabriz. Then followed almost ten years of uncertainty about mission work in Urumia, which was now named Rezaieh after the new Shah. In the partly ruined old hospital, and later in a rented building, Dr. Ellis and a small staff carried on to meet the acute needs of the people, Muslim as well as Christian; but still there was no decision about the rebuilding of the hospital or the return of Dr. Packard. The Iranian Government, remembering his stout championship of the native Christian people and fearing complications with marauding Kurds, never gave permission, with the final result that direct American Mission Work in Urumia ceased; but there remained many small Nestorian Presbyterian Churches and some native physicians who began their training under Doctors Packard and Ellis. Westminster shifted its principal base of Missionary activity to Kermanshah, where Dr. Packard took over the new hospital in 1932. The interest of Westminster Church in Iranian Missions was recognized by The Presbyterian Foreign Mission Board on its Fiftieth Anniversary, by the appointment of Mr. and Mrs. Norman P. Clement as official representatives of the Board to visit Mission Stations in that Country. 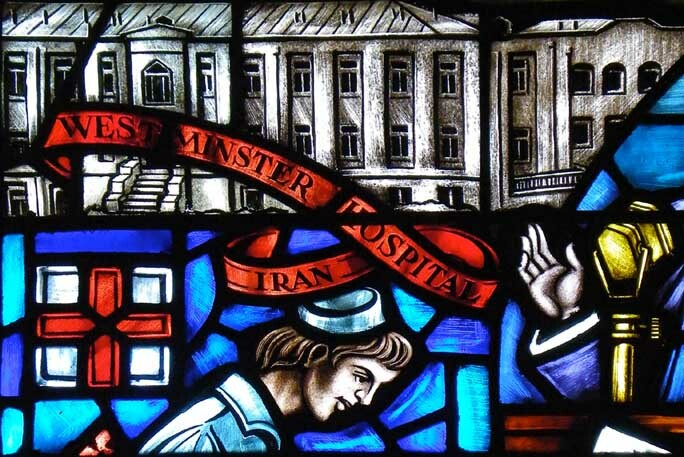 In their report to the Church, published in the 1940 Year Book, they made it clear how impressed they were - first, with the great need for medical and surgical care; second, the substantial support from patients (amounting to 80% of the hospital expense); third, the gratitude and good-will of the highest Iranian Authorities; and finally, with the Christian influence of the Missions making its way through the population. Under the new Shah in 1940, the Iranian Government embraced some Western ideas, among them Public Health Service; and in Kermanshah as elsewhere, there was excellent cooperation between the Government Red Lion and Sun Hospitals, and our Hospital. The Second World War involved Iran again, because Shah Reza Khan favored the Germans. Consequently Russian Troops entered from the North and British Troops from the South. In 1943, the United States established the Munitions of War Transport Service from the Persian Gulf to the Russians on the Caspian Sea. This brought many Americans, as well as European soldiers and personnel, into contact with our Mission Station. Thus, an unforeseen phase of our Mission Work developed-namely, medical aid and comfort to American soldiers in far-off Kermanshah. In 1943, Dr. Packard retired after thirty-seven years as our Missionary Physician. The common people as well as the authorities of Iran paid exceptional tributes to him. Seldom has a Church been better served with such an "Ambassador of Christ." After that, and up to 1959, Dr. and Mrs. Bussdicker and Dr. and Mrs. Joseph P. Cochran, Jr represented Westminster in Kermanshah. In these later years the work steadily grew in scope and influence, and constituted a shining example of Christian democracy and friendship in a time of violence and confusion in that ancient land.